The above quote is sitting on my laptop and is a promise I made to myself at the beginning of the year. Though it’s been a while since a post has gone up here, I can say that I’ve been writing daily in other forms and spheres of life. And though I can make excuses aplenty for why it’s taken me this long to get a post up, I won’t. I’ll rather write a full update later on this week to explain what I have (and haven’t) been doing recently. Personal stuff aside, today’s Writing Wednesday post is to remind you, dear reader, to be gentle with yourself and your failures – and to stop holding yourself back. Your harshest critics aren’t always out there in the world, and you’ll find that far more often they’re sitting in your head and holding you captive; saying you’ll never be good enough, that you don’t have enough time, that what you’ve done is under par and you should quit while you’re ahead, that you’re making a fool of yourself and no one will ever take you seriously. That you’re wasting your time and energy on something you’ll never complete anyway. The writing blues will strike and though these thoughts are persuasive, it’s high time for you to ignore them, hard though it may be. Even if that post or chapter you’ve planned hasn’t gone further than a scrawl on a scrap of paper, or come drifting back to you as a thought that keeps returning until you finally take notice of it, just relax. You’ve got this! Carry on doing whatever project you’re stuck on, regardless of what life (and circumstances) throw at you, sometimes just by starting again, you’ll find you make time where you previously thought you had none. Commitments to yourself are as important to honour as commitments to others. 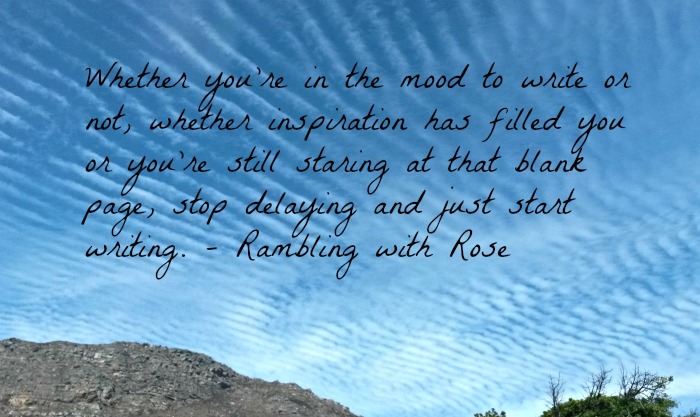 If time isn’t an issue for you, and instead you’re finding it hard to stay motivated, then find a writing group to join, a forum you can find inspiration within, a blogger or writer who encourages you to persist (either one you know personally, or someone you admire who compels you to go for your dreams). Go for a walk, take up a hobby, troll Pinterest, re-read your favourite novels, paint, dance, draw, act. Do something that will shake you up again and inspire you and give you back your enthusiasm! After all, if you never try, or do and then give up half way, you’ll never succeed – and good or bad, life and writing is what you make of it. I’ve just attended a retreat where one of the biggest pieces of advice was: “Writing is 99% perspiration, not inspiration.” Getting black ink on white paper. Boy does your advice parallel with that! !